Feb. 4, 2019, 10:40 a.m.
By Tim Hornyak @robotopia Feb. 4, 2019, 10:40 a.m.
Social media remains a dominant source of news for consumers in many countries, outpacing newspapers in 2018 in the U.S., where 45 percent of people get news from Facebook. News providers need any edge they can get to compete in a time of declining profitability and fake news. Nordot is a Tokyo-based joint venture launched in April 2015 with backing from two of Japan’s biggest news companies, Kyodo News Digital and Yahoo Japan. It operates on something like the kind of model Knight called for: a common publishing and content-sharing platform that offers more than 50,000 articles from hundreds of publishers in Japan. Nordot brings together content providers and distributors so that both can minimize costs, and has just launched an English-language version of its website. Major outlets can source news at no cost; smaller publishers can reach a far larger audience; both sides earn ad revenue. The syndication startup says the Kumamoto Nichinichi Shimbun, a regional newspaper in southern Japan, doubled its ad revenue per story by using Nordot while growing its audience and brand recognition. 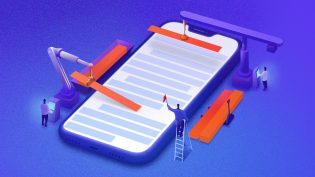 Nordot says its platform already has 6 million readers, and about 400 publishers are using the platform, the majority of them regional newspapers in Japan such as the Kyoto Shimbun, Kobe Shimbun, and Hokkaido Shimbun. Other users include major media brands Quartz and HuffPost, sports and entertainment sites like Rakuten NBA News and Cinema Today. Providers can move their content onto Nordot’s cloud service in a variety of formats. Editors can then search for and select what they want to include on their sites, apps, or social media. Content can also be automatically used on selected keywords. When users click on a preview, articles and graphics appear in a pop-up under Nordot’s domain with the provider’s brand at the top, links to the provider’s site and social media accounts, as well as a slew of suggested articles at the bottom. A former journalist, Nakase founded Nordot after working at business publisher Nikkei BP, Yahoo Japan, and Kyodo. He wanted to create a “collective newsroom” that could offer a more equitable balance of large and small players in the content business. Kyodo agreed to invest in the Nordot concept, putting in 85 percent of capital with Yahoo Japan putting in 15 percent. The company now has about 10 staffers across Japan, the U.S., and Malaysia. 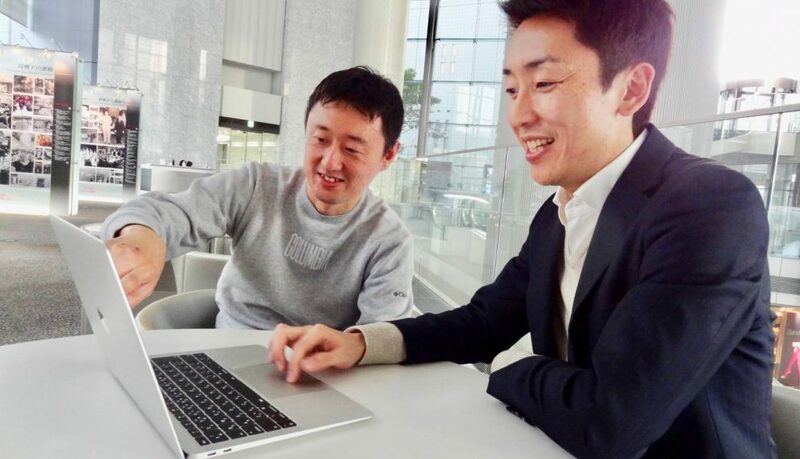 In a rare setup for a Japanese startup, Nordot has no offices and, aside from occasional meetings, all work is done online. A version of this piece ran on Splice. Photo of Nordot’s Yoshiaki Machi and Ryutaro Nakase by Tim Hornyak used under a Creative Commons license. POSTED Feb. 4, 2019, 10:40 a.m.
Hornyak, Tim. "In Japan, a content-sharing platform for publishers aims to even the playing field between big and small." Nieman Journalism Lab. Nieman Foundation for Journalism at Harvard, 4 Feb. 2019. Web. 23 Apr. 2019. Hornyak, Tim. "In Japan, a content-sharing platform for publishers aims to even the playing field between big and small." Nieman Journalism Lab. Last modified February 4, 2019. Accessed April 23, 2019. https://www.niemanlab.org/2019/02/in-japan-a-content-sharing-platform-for-publishers-aims-to-even-the-playing-field-between-big-and-small/.